We will be clebrating the opening of the newest X MARKS THE ART exhibition, Redrawing the City. The exhibit has been curated by San Antonio artist and Texas State Associate Professor of Art, Joey Fauerso, and presents the work of six emerging Texas-based artists and recent BFA graduates of Texas State University: Julio Barrientos, Kate Garner, Darby Hillman, Hope Mora, Kameron Richie, and John Tennison. Responding to the San Antonio urban landscape, culture and architecture, the six artists employ a wide range of material and conceptual approaches to create new pathways, rhythms and creative intersections throughout the heart of San Antonio’s rich and diverse downtown. There are 18 unique installations impacting 13 properties. During the reception light refreshments will be served followed by an artist discussion. At 6:30 p.m. the artists will lead guided tours of their installations. In honor of Contemporary Art Month, Public Art San Antonio is hosting an X MARKS THE ART: “Artist Showcase” to feature the artists who have participated in the recent X MARKS ART: “Light + Technology” series which is currently on view in various vacant storefronts in downtown San Antonio. The series highlights San Antonio based artists and collectives who are activating vacant spaces downtown with a series of light and technology based art projects. Installations explore innovative uses of interactive systems, social media, lighting, and sound in the context of the busy downtown pedestrian experience. For the event images of the installations will be on exhibit and participating artists will give a brief 5 minute presentation about their current work. Light refreshments will be served. Participating artists include: Jimmy James Canales + Ruben Luna; Sarah Castillo + Roberto Marquez; Jenelle Esparza + Rigoberto Luna; Krisitn Gamez + Mari Hernandez; The Lullwood Group; Mark Menjivar; and Taeg Nishimoto. If you are downtown doing a self-guided tour of the X MARKS THE ART: Light + Technology installations, be sure to check out the Center City Development offices new initiative OPEN, which has brought several Pop Up shops downtown for the 2013/2014 holiday season. The holiday shops were so successful they have extended several of them through February. Featuring Rex Hausmann’s Every Town is a Topic with David Almaguer and Kyle Martin in the storefront windows. For one night only, a vacant space will become vibrant and full of art, dance, music, and fashion. The Center City Development Office, the Office of Historic Preservation, and the Department for Culture and Creative Development are partnering to host the first Center City Open House event. This unique networking opportunity will showcase an underutilized space and encourage investment in San Antonio’s vacant historic buildings. Artist Rex Hausmann and friends will add new life to the downtown storefront. Ballet San Antonio perform “Da Luz,” a neo-classical piece representing famous statues coming to life. 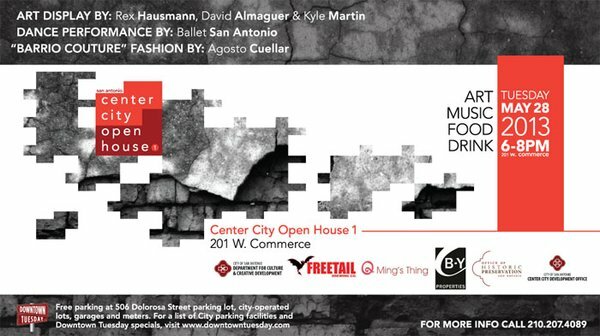 San Antonio fashion designer, Agosto Cuellar, will glam the evening up with his signature spin on fashion. Complimentary drinks from Freetail Brewery and international hors d’oeuvres by Ming’s Thing. This event is free and open to the public. Guests can take advantage of the City’s Downtown Tuesday free-parking initiative. Complimentary parking at 506 Dolorosa Street parking lot after 5 p.m. For more information, please contact Colleen Swain at colleen.swain@sanantonio.gov or 210.207.4089. Sat. March 9th, 7 p.m. – 12:00 a.m. LUMINARIA 2013, 231 E Houston St.
All tours and events commence at Argo Plaza, an outdoor area facing the river walk behind the IBC Bank Building (175 E. Houston St.) on the corner of N. St. Mary’s and E. Houston streets. Groups of 6 or more can also schedule a guided tour of the installations by contacting Marissa Laubscher, marissa.laubscher@sananronio.gov, (210)207-1435. Space on walks is limited. Please RSVP for walks to marissa.laubscher@sanantonio.gov 207-1435 or on facebook (Public Art San Antonio). PARKING IS FREE on Tuesday nights after 5pm in any metered spot or city owned parking garage as part of DOWNTOWN TUESDAY’S. Many downtown businesses also offer specials and live music on Tuesday nights, so join us for a tour and make a night of it!